Thank you for your interest! 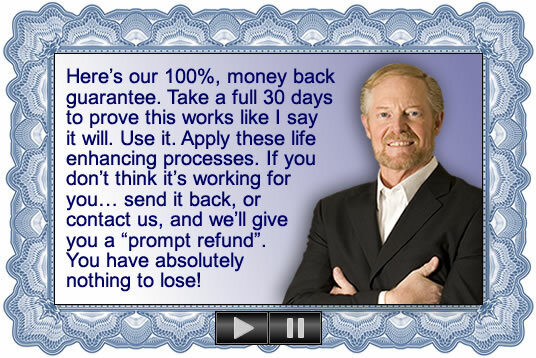 However, appears that you are already signed up for the success building videos. You should have also received a link to the free audio program and eBook titled “Energize Your Life -- Using Your Brain For A Change!" Getting a grip on the negative side of your mind is essential to feeling great and achieving long-term success. Use this powerful strategy to immediately stop the negativity and trigger mental positive! Unfavorably comparing yourself to others -- what they can do, or have, etc. Do any of these sound familiar? Through using the “Negative Self-Talk Eliminator” you can take control over that mental critic that’s been living inside your head! Your negative self-talk may be making you sick! "Negative Self-Talk Can Ruin Your Health"
Standard medical textbooks used in the United States and European medical schools state that between 35% to 70% of illnesses are related in some way to chronic stress or psychosomatic (negativity or mental upset) origins. The August 2008 National Health Statistics Report showed that in a one year period, there were 39.6 million doctor visits where the diagnosis was “Hypertension”. Of the 307 million people in just the US alone, there are 73.6 million people who have hypertension! Think about this—approximately half the time, the list of illnesses you see above can be connected to or are caused by hypertension. Do you know what the #1 leading cause of hypertension is? Stress. Do you know what the leading cause of stress is? Negative self-talk and feeling emotionally out-of-control. I can show you just as I have people from all over the world, exactly how you can get control over negative self-talk and all the destructive emotions that go along with it! When you get your hands on “The Negative Self-Talk Eliminator” , you can start to experience the positive changes you want the very first day! This is the exact brain strategy I’ve used with thousands of clients and athletes one-on-one to help them break-through to new levels of personal fulfillment and success. During the last 30 years I’ve worked with over 1,000,000 people individually and in groups helping them overcome emotional distress and health problems, generate business successes, and build more fulfilling lives. There’s a hard way and an easy way to do just about anything. Why would you want to start from scratch, trying to figure this out all on your own, when I’ve already researched, developed, refined and polished this powerful strategy that absolutely works? AND, I’m handing it to you ready to go — ready to use — right now! Just listen to the audio program. Follow along. It’s as simple as that! Thousands have done it — and so can you! I blend together proven life improvement strategies I’ve discovered over years of using Neuro-Science, and Cognitive and Behavioral Psychology with my patients. If you are like the majority of us, we either know someone, or have experienced some of these stressful situations ourselves. You don’t have to be at the whim of your internal critic any longer. You can now do something about it—right now—beginning today! Knowing how to apply the power of your mind is crucial to every area of life. I’ve helped sharpen the focus and mental side of performance for over 150 Olympic level athletes—gymnasts, marathon and long distance runners, archers, boxers, discus throwers, martial artists, weight lifters, swimmers, skiers, and more. I’ve taught these strategies to highly ranked golfers and tennis players. If you analyzed anyone who is highly successful, you’d learn they must get and keep that fine-focused mental edge—and, they learn strategies so that the negativity never drags them down. We train the outstanding men and women of All Hazard and Incident Command Teams on how to use these types of strategies. So they can better deal with disasters like 9-11 in New York City, Hurricanes Katrina and Rita, and the enormous destructive wildfires that burn through our lands. These strategies help them to release the negative and stay focused on the positive—even in the toughest of times. It’s possible that you might stumble into success. BUT, if you want to have consistent, ongoing success, using this time-tested, proven model for handling the negative in your brain is essential. Having a background as a positive, successful national level gymnast, I’m not really sure when and how negative self talk crept into my mind and became the guiding compass of my life, but it did. And in hindsight, I am certain it has seriously prevented me from reaching my full potential in a number of areas. The dozens of self help books I’ve read sounded good, but didn’t seem to work very well long term, so I kept on searching. 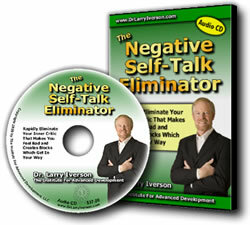 Then I came across Dr. Iverson’s “Negative Self Talk Eliminator” CD and gave it a try. As I listened to Dr. Larry and performed his easy step-by-step process, I rapidly began to feel refreshed and energized. By the time I finished the CD, I could feel a real shift, and that negative voice was gone. What replaced it, is a positive, uplifting and supportive coach voice that makes me feel great and deepens my focus. I am happier, more productive and life is good!!! I just love it. Thanks Dr. Larry !!! The pattern of negative self-talk happens so fast, you may not even be aware it’s happening. It’s often covered up by saying things like: “Well, I’m just being realistic.” Hogwash! You’re being negative! 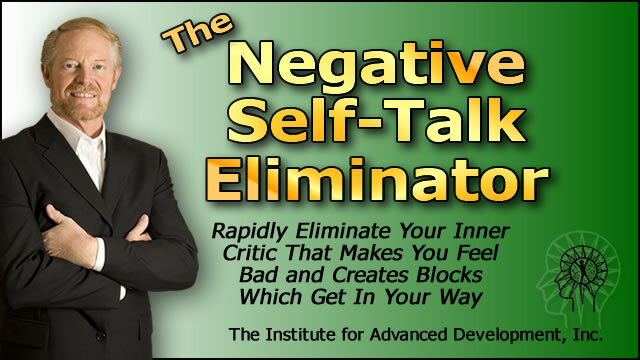 Using the Negative Self-Talk Eliminator you go straight to the source of the negativity and change it. You catch that negative “mental gremlin” and alter it—permanently! Aren’t you tired of living with fear, guilt, depression and self-criticism? Then do something about it today! Use this proven brain strategy and overcome that negativity habit. If you had to do battle with someone who is bigger, faster and meaner than you, what would you want? You’d want someone there to help you who is tougher than the bad guy—right?! The Negative Self-Talk Eliminator is in your corner, and definitely able to win the battle. Take The Handcuffs Off Your Brain - Now! Do you like it when someone criticizes you? How do you like it if someone is sarcastic or makes fun of you? Have you ever been bullied by someone, and you felt scared, or small, or incompetent? If you think it’s bad when someone else does this to you -- that’s nothing compared to when you do this to yourself. Clinical research from John Hopkins University Medical School has shown that the long term negative effect on your mental and physical health is 2.5 times greater when you bad mouth yourself, than when you are bad mouthed by another person. The primary reason it’s so much worse when you pick on you, is because you can blow-off what someone else says, but you have little to argue with when it’s your own mind putting you down. "Catch & Handle Your Run-Away Self-Talk"
Here’s what happens. There’s a part of your mind that tells you, “See, you blew it again! You always do that! You’re just no good at it!” Your unconscious then creates a negative gut feeling as a reaction to this self-criticism type thinking pattern. These two separate mental signals (self-talk and feeling) reinforce each other. When they blend together, they create a third mental signal confirming this is true—thereby deepening the belief that you really are a schmuck! It is a self reinforcing pattern. Enough already!!! You can break this self-defeating pattern and end your old negative self-talk tyranny right now! Ever heard the saying “Garbage in, garbage out.” This applies directly to your thoughts. It is not humanly possible to feed your brain an ongoing diet of mental garbage, and have your brain feed back the success thoughts required to build an amazing life. There’s a very core reason why negative self-talk is so harmful. You may not be as good as you’d like at a sport you do. You may not be very good at math. You might not be the most skilled person in your work group, so you’re a bit slower. You may have screwed up a task, or forgotten something that was important. In your mind it’s often an “all or nothing” type of perspective. For the majority of people, this occurs when you’re under pressure or feeling stressed, during a deadline, when you feel like you are or will be observed, if there’s turmoil going on, or when change is occurring. The problem is that this mental negativity becomes an automatic response—a regularly occurring bad habit. 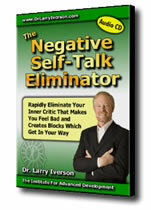 "The Negative Self Talk Eliminator has repeatedly proven to be a great help in difficult times. Right in the middle of an overwhelming situation, I used this powerful strategy, and instantly gained control and felt better! This amazing program just blew-away the cycle of negative self-talk. It gave me a rapid "lift" on the spot. I highly recommend it! Anyone can benefit. This is a fast and easy way to get control and move into the positive, rather than just staying stuck "spinning in the negative". Are you tired of that nagging little voice in your head? Would you like to overcome that discouraging focus on your flaws? "Overcoming Stress & Anxiety In Your Life"
Remember that stress and psychosomatic related illnesses contribute to as much as 70% percent of all illnesses that people suffer from today. Millions are negatively affected by stress related disorders, but they don’t have to be. There are ways that you can make stress disappear, or even work FOR instead of AGAINST you! Have you ever wondered how in the world you can manage the stress you feel? Well, wonder no more! 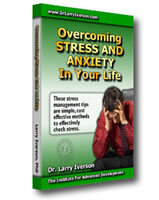 I have compiled information in my eBook that will allow you to begin leaving your stress behind. “Overcoming Stress & Anxiety In Your Life”. This sells for $17 -- but when you order now -- you’ll receive your copy FREE! This eBook goes hand-in-hand with the Negative Self-Talk Eliminator program. Blow-Away Stress And Tension Immediately!" Everyone feels stress. It’s a fact of life. This kind of pressure can overtake you and make you feel completely out of control. There are a number of ways out—and you’ll find them in my book! There’s absolutely no reason why you have to suffer this way anymore. I’m giving you a way to overcome it—right here—right now—FREE. There are all kinds of self-help books out there that can help you deal with stress and anxiety. But most of them are written using one or two ways to bring about change. With "Overcoming Stress & Anxiety In Your Life", you’ll get a comprehensive guide to dealing with stress, anxiety, and the pressures of life that keep you from being happy. You’re not just getting one helpful process—you’re getting over 20! Not only will you better understand stress and anxiety, you’ll also get valuable strategies and tips on how to combat that stress and take back your life starting today! "In This Book You Will Get 25 Proven Ways To Reduce Your Stress, Relax More Quickly and Easily, And Get A Boost In Your Mental & Physical Energy!" Stress is all around you, and will always be a part of life. You need to be more resilient and pro-active when coping with your stress, so you feel great all the time. Which is exactly why I’m giving you this FREE book when you order my Negative Self-Talk Eliminator audio program. We’re offering you the chance to finally beat stress and anxiety once and for all. Give yourself more strategies for greater happiness, increased energy, and less stress by getting your copy of Overcoming Stress & Anxiety In Your Life right now! There are many books that offer way less solid benefit than this, and can cost you as much as $50.00. BUT you can claim your FREE copy of this great 65 page book when you order the “Negative Self-Talk Eliminator” program. Quickly learn to control the voice in your head. It’s that internal dialogue that works you into being stressed, angry, sad, afraid, depressed, overwhelmed and anxious. Your inner critic can be turned into an ally and a coach who’s on your side. That voice in your head never stops talking. Never! No matter what some teachers say, you can’t stop the internal dialogue. The reason, is because your self-talk is a Beta brainwave function. And, as long as you have Beta brainwaves firing in your head, you’ll have that voice chattering at you. The only time Beta brainwaves stop is when you die or if you are brain dead. It’s vital that you gain control over the way you talk to yourself. "Direct Your Self-Talk So You Feel Great And Get The Mental Edge Essential To Creating The Life You’ve Only Dreamed Of"
The Negative Self-Talk Eliminator is a highly refined, proven strategy for giving you control over your negative internal dialogue. This program assists you in gaining mastery over your thoughts, which is crucial if you want to have continuous success. During this audio program Dr. Iverson guides you through this life enhancing strategy. You will rapidly fine-focus your mind to stay on a positive track so you can have long-term vitality and health, financial success, great relationships, peace of mind, happiness, and a fulfilling lifestyle for yourself and those you love. Begin today to have more control over your negative self-talk than you’ve ever even imagined possible. You’ll also receive “Overcoming Stress & Anxiety In Your Life” A $17 value—you’ll receive FREE! <<< When You Order Now! When you order now, I will also send you my Audio Program “Unchain Your Brain -- Strategies for Rapidly Overcoming Worry and Distress”. You’ll get this second bonus for no additional charge. If you look in our product catalogue, you’ll see you would normally pay $37.00 to buy a copy of this amazing audio program. This is one of my most requested live keynote trainings. 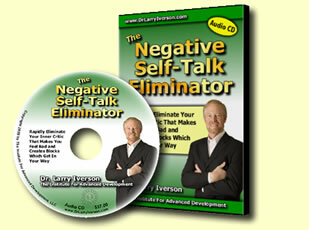 This additional Bonus is available only if you order The Negative Self-Talk Eliminator” now. The “Unchain Your Brain” audio program all by itself is worth 100% of the price of the entire program - and raises the total package value to $91, though you pay only $37 for the CD and both bonuses! Claim your 2 FREE bonuses when you ORDER NOW! "Are You Finally Ready To Learn How To Eliminate That Negative Self-Talk In Your Head From Someone Who Has Helped Thousands Get More Control Over Their Mind?" Yes! I want to learn these powerful self-talk strategies now! Order the downloadable program and you'll be able to start this life changing program immediately. Use the order button below and within minutes you'll be able to download “The Negative Self-Talk Eliminator” and your free bonuses “Overcoming Stress & Anxiety In Your Life”, and "Unchain Your Brain". Start managing your mind more effectively. Order today! Order now and we’ll rush your CD of the “Negative Self-Talk Eliminator” program directly to you. Within just a few minutes after you order, you’ll receive an email containing a link so you can download your copy of “Overcoming Stress & Anxiety in Your Life” and "Unchain Your Brain". Take advantage of this great offer. Order now! PS. Because you are ordering now, even if you decide this amazing program is not for you and want a refund, you can still keep both bonuses of my “Overcoming Stress” eBook, and the “Unchain Your Brain” audio training.